The strong outlook of the global adhesives industry combined with the increasing demand for polyethylene terephthalate (PET) will drive demand for acetic acid in the coming years, finds Transparency Market Research in its latest report. The market study, titled ‘Acetic Acid Market - Global Industry Analysis, Size, Share, Growth, Trends and Forecast, 2012 - 2018,’ states that the market will log a 9.3% CAGR through the report’s forecast period. 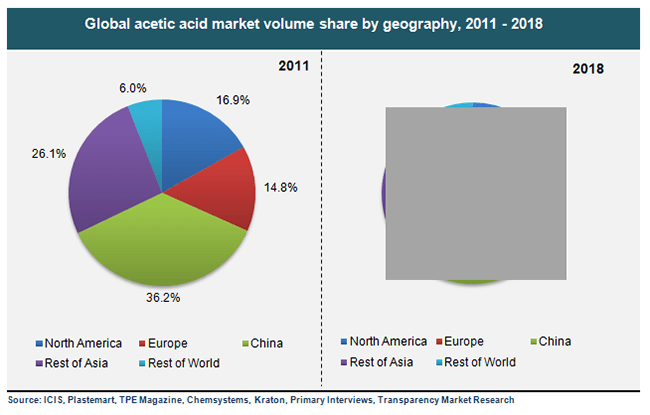 While the global acetic acid market was valued at US$5.93 bn in 2011, it will stand at US$10.31 bn by 2018. The report also estimates the global acetic acid market in volume terms. When studied thus, the report notes that the demand for acetic acid was 9,612.5 kilo tons in 2011 globally. In terms of volume, the global acetic acid market is expected to post a 4.8% CAGR over the report’s forecast period. Although projected to exhibit good growth in terms of both revenue and volume, the volatility in raw material prices will adversely impact the global acetic acid market. However, the impact of this restraint can potentially be alleviated by the emerging opportunity of TCX technology, which marks a breakthrough in the production of fuel ethanol. Acetic acid witnesses a high demand from various chemical processes as it is an important chemical reagent. Besides industrial uses, acetic acid also finds applications in the form of a condiment, food additive, as well as a descaling agent. Acetic acid is produced either via methanol carbonylation or acetaldehyde oxidation. The former method is used for producing about 75% of acetic acid globally. On the basis of applications, the report segments the global acetic acid market into vinyl acetate monomer (VAM), acetate esters, purified terephthalic acid (PTA), and acetic anhydride. Of these, VAM and PTA are the leading applications of acetic acid, collectively accounting for more than 55% of the total acetic acid consumption globally in 2011. End-use industries such as adhesives and sealants and packaging are seen to stimulate the demand for both of these applications over the report’s forecast period. The demand for VAM is projected to remain strong through 2018 thanks primarily to high demand from end-use industries. TMR analysts expect PTA to show the highest rate of growth till 2018 among all application types in the global acetic acid market. Likewise, the study also segments the global acetic acid market on the basis of geography for an in-depth analysis. Segmented thus, the market is composed of North America, Europe, China, Rest of Asia Pacific, and Rest of the World. In 2011, China consumed an estimated 36.2% of all acetic acid produced globally, making it the single-largest market for acetic acid. China’s leading position in the acetic acid market can be credited to a high degree of industrialization in the country, backed duly by strong economic progress. The China acetic acid market is projected to log a CAGR of 5.4% between 2012 and 2018. The growth of the acetic acid market will not be as promising in North America and Europe because demand from end-use industries here nearing a point of saturation. From the competitive standpoint, the global acetic acid market is characterized by the dominance of the four top market players, who collectively hold over 60% of the market. Leading players in the acetic acid market are: Celanese Corporation, British Petroleum PLC, Eastman Chemical, JinagsuSopo, SABIC, and LyondellBasell.